In the period following the first multi-party elections in the nineties, governing and opposition coalitions emerged to play a significant role in the political environment of many African countries. Many of these coalitions were formed for the purpose of either strengthening the governing party or creating a viable and strong parliamentary opposition. Some party coalitions have undoubtedly contributed to consolidating countries’ initial steps towards democracy, through power-sharing arrangements. Sadly .unprincipled. political coalitions, which have resulted in political opportunism and short-term political maneuvering, have also been created. In many of these countries there has been a tendency for political parties to coalesce in order to serve particular short-term interests of the key players involved. Whatever the reasons, it is observable that political party coalitions, alliances or even political alignments and cooperative agreements will continue to significantly direct the politics in the continent. However, hitherto little analysis of political party coalitions in Africa has been conducted from a comparative perspective. The Danish Institute for Parties and Democracy (DIPD) launched Coalition Building . 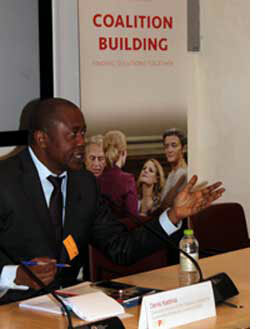 Finding Solutions Together [PDF, opens new window], co-authored by the EISA Executive Director, Denis Kadima, in Christiansborg on 14 December 2015. 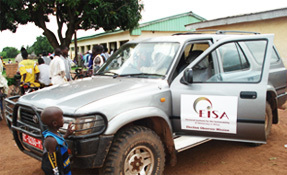 In 2013, building on research conducted from 2003 onward, EISA’s Eighth Annual Symposium was dedicated to Understanding the Causes and Consequences of Political Party Alliances in Africa. As a result of the work done at the Symposium an entire issue of the Journal of African Elections (13(1) June, 2013) was devoted to Understanding the Causes and Consequences of Political Party Alliances and Coalitions in Africa. The EISA Chad Field Office developed a manual, Tsad: Le contentieux ilectoral au Tchad a l’usage des partis politiques, and provided capacity building workshops for political parties and established a resource centre for political parties, creating an environment for political parties to engage in dialogue and explore areas of common interest. A Political Parties Programme Handbook was published as a tool for the development of country specific training manuals and presentations can be developed. The six modules covered are: political parties; leadership; public outreach; party coalitions/alliances; and conflict management. Activities carried out in 2008 focused on workshops for ruling and opposition parties in Lesotho, South Africa and Sudan through partnerships with the Netherlands Institute for Multi-party Democracy (NIMD), the University of Bergen (UiB), and the Swedish Christian Democratic International Centre (KIC), with customised training workshops based on this manual. Managing Intra-party and Inter-party Conflict in Lesotho: Training Manual, 2008. This manual facilitates a tailor-made training workshop for political parties in Lesotho in their efforts to prevent, manage and resolve intra-party and inter-party conflicts. A Capacity-building training workshop was conducted in Khartoum, Sudan from 21-23 May 2007. The six major political parties in Sudan attended. The overall objective of the workshop was to provide a platform for parties to discuss issues pertaining to their internal governance and functioning. The parties looked specifically into issues of internal governance, organisational structures, membership, leadership selection/election, party competition and party coalitions. Based on this experience, a training manual on strengthening political parties was drafted consisting of six modules: political parties; leadership; public outreach; party coalitions/ alliances; and conflict management. The manual was tested in two workshops. The first one was held in Gaborone, Botswana from 24-26 October 2007 and the second in Mbabane, Swaziland from 19-21 November 2007. The manual was revised based on the the observations of the facilitators during the workshops as well as on input from participants with an eye to publication as a standard training manual for parties in the SADC and beyond. The Capacity-building training for parties in Botswana attracted ten political parties, including the ruling party and main opposition party. In Swaziland the three main political organisations and a political youth wing were trained. The workshops covered five thematic areas: gender representation, intra-party democracy, and inter-party relations, outreach activities, conflict management and leadership in political parties. In 2006 The Politics of Party Coalitions in Africa, edited by EISA’s Executive Director Denis Kadima, was published. The authors documented, analysed and elucidated various aspects of the coalition process as it has played itself out in Kenya, Malawi, Mauritius, Mozambique and South Africa. In 2005 Denis K Kadima and Roukaya Kasenally published The Formation, Collapse and Revival of Political Party Coalitions in Mauritius: Ethnic Logic and Calculation at Play in Journal of African Elections Volume 4 Number 1, June. A 2003 Roundtable meeting: Strengthening democracy through party coalition building was hosted by EISA and the Konrad Adenauer Foundation (KAF) in June 2003. The leaders of the various political parties in South Africa examined the practicalities and their responsibilities in coalition formation and collapse. Political party representatives provided comparative perspectives on topics such as ideologies of political parties in the formation of coalitions, policy frameworks used for implementation and other aspects involved. In the period following the first multi-party elections in the nineties, governing and opposition coalitions emerged to play a significant role in the political environment of many African countries. Many of these coalitions were formed for the purpose of either strengthening the governing party or creating a viable and strong parliamentary opposition. Some party coalitions have undoubtedly contributed to consolidating countries’ initial steps towards democracy, through power-sharing arrangements. Sadly .unprincipled. political coalitions, which have resulted in political opportunism and short-term political maneuvering, have also been created. In many of these countries there has been a tendency for political parties to coalesce in order to serve particular short-term interests of the key players involved. Whatever the reasons, it is observable that political party coalitions, alliances or even political alignments and cooperative agreements will continue to significantly direct the politics in the continent. However, little analysis of political party coalitions in Africa has been conducted from a comparative perspective. EISA initiated a study on coalition practices in five African countries, namely, Kenya, Malawi, Mauritius, Mozambique and South Africa. This is primarily a survey that will be undertaken in the form of country papers that aim to investigate coalition formation practices; their purpose, functioning, the reasons for their success/failures. The study will also analyze them from a country specific perspective taking into consideration the different conditions prevailing in each country.